Syrian President Bashar al-Assad has now played his “Kurdish card” -- not to win Syria back, but mire Turkey and hopefully walk away with an Alawite state. This explains why he mobilized his Qaeda-linked surrogates to take control of Kurdish areas in the north of Syria on the border with Turkey. In the face of the Syrian uprising, Assad forces originally pulled out of those areas in July and August 2012, hoping the vacuum would be filled by Turkey’s nemesis at the time, the Kurdistan Workers’ Party (PKK). The March 2013 peace deal between Turkey and the PKK spoiled Assad’s plan. His fallback in recent weeks on his Qaeda-linked proxies – Jabhat al-Nusra and the Islamic State of Iraq and the Levant (ISIL) – is to keep the plan alive. 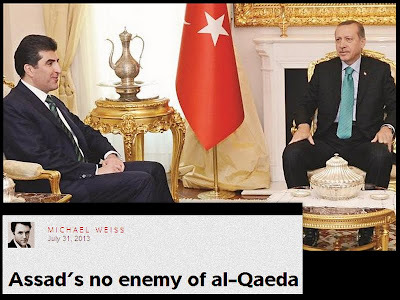 In context, I can’t think of a better eye-opener than yesterday’s commentary by Michael Weiss fittingly titled “Assad’s no enemy of al-Qaeda.” You can read it here. Overnight, news broke of jihadist groups linked to al-Qaeda -- read Assad -- having taken hostage around 200 Kurdish civilians after violent clashes with Kurdish fighters in two villages of northeastern Syria. “Fighters of Jabhat al-Nusra and the ISIL have seized control of Tall Aren village in Aleppo province and are laying siege to another village nearby, Tall Hassel,” said the London-based Syrian Observatory for Human Rights. Clashes between jihadists and Kurdish fighters have raged for some two weeks, after jihadists were expelled from the key town of Ras al-Ayn on the Turkish border. The fighting claimed a prominent casualty on Tuesday, as a car bomb planted by Jihadists killed Kurdish leader Isa Huso, a leading member of the Kurdish Democratic Union Party (PYD), a pro-PKK organization of Syrian Kurds and the most powerful faction of the ethnic group in the region (see yesterday’s post). Politically, Turkish Prime Minister Recep Tayyip Erdogan met yesterday with Nachervan Barzani, prime minister of Iraq's Kurdistan Regional Government and nephew of KRG President Massoud Barzani. The two-hour meeting at the Prime Ministry in Ankara was closed to the press. The talks are believed to have focused on bilateral relations, the PYD’s agenda in Syria and the upcoming three-day Kurdish National Conference. The latter opens in Erbil on August 19 with 500 Kurdish delegates attending, mostly from Iraq, Turkey, Syria and Iran. Before Barzani's visit, PYD co-chair Salih Muslim, a graduate of Istanbul Technical University in the late 1970s, was able -- on Turkey’s invitation -- to fly from Erbil to Istanbul after 35 years. The understanding is that such a provisional local administration would include other ethnic groups such as Christians, Turkmen and non-Kurds who live in the Kurdish-majority areas of northeastern Syria. Turkish columnist Sedat Ergin, writing for Hurriyet daily, says Turkey’s dilemma of late was to choose one of two options that would serves it interests best: Control of Syria’s Kurdish areas by the PYD or by the Qaeda-linked groups? “We understand from Muslim’s interview with Ali Çelebi for Özgür Gündem daily,” writes Ergin, “that the Justice and Development (AKP) government has gone for the first option. “…This being the case, instead of approaching the Syrian Kurds with animosity, building a permanent friendship with them starting today appears to be a wiser, more realistic policy. The path to this passes along a road that approaches them with respect, knows them and talks to them as counterparts. Separately, Turkey has also stepped up economic relations with the Kurdistan Regional Government in northern Iraq. The KRG is now pushing ahead with plans to build an oil pipeline between Turkey and northern Iraq despite objections from Baghdad and the United States.